To quickly charge the batteries while the engine is running, we recommend an additional ‘high output’ Mastervolt alternator on the engine. Standard alternators, originally designed for the car industry, only deliver sufficient energy to both charge the batteries and power the various onboard consumers when they reach a very high rpm. These alternators also tend to be temperature-sensitive: In a higher ambient temperature, such as is common in an engine room, their output quickly falls by 50 % or more. This is not a problem in cars as the small amount of energy used during, for instance, starting can be recharged in no time, and windscreen wipers, ventilators, etc. do not need a great deal of power. In general, a car engine also runs at a far higher rpm than a boat’s engine, and the temperature under the bonnet is lower due to the cooling effect of the head wind. Mastervolt Alpha alternators are specially designed for ships and professional mobile applications to provide sufficient power even with a low rpm. A pulley ratio of 1:3 and an engine idle speed of around 700-800 rpm will generate substantial current for charging the battery sets and powering the connected equipment. Mastervolt alternators are also resistant to the high temperature of the engine room, allowing the engine to serve as the energy source for onboard consumers and as a quick charger for the service batteries. Make sure you do not choose your alternator too small. A larger one will ensure that the battery is charged faster and engine hours are kept to a minimum – we suggest choosing an amperage between 30 and 50 % of the battery capacity. 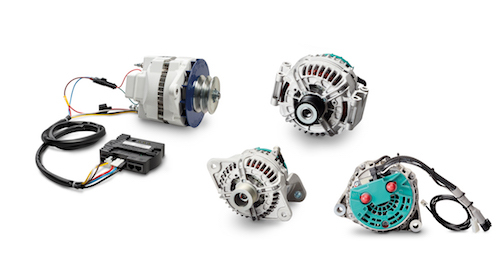 The standard alternator designed for road vehicles has a voltage regulator mounted to the back of the alternator and set to a single charge voltage of 14 or 28 volt. This is sufficient for a car battery, which is rarely (if ever) discharged. Furthermore, the voltage regulator of an automotive alternator is often temperature sensitive and in high temperatures regulates the voltage even further down, often to 13.5 or 26.5 volt. This is much too low for sufficiently recharging a discharged battery. The maximum achievable battery capacity for these voltage levels is around 60 to 70 %. The lifespan of a battery is significantly lower if it is never properly charged. In order to adequately recharge a partially empty or completely flat battery at 25 ºC, voltage need to be 14.25 volt for a 12-volt battery and 28.5 volt for a 24-volt one. Once the battery is 100 % full, this voltage must be reduced to 13.25 or 26.5 volt (float phase) to prevent the batteries from becoming overcharged. Mastervolt alternators are delivered ungrounded, i.e. the negative pole of the alternator is not connected to the alternator casing but has a separate connection. This means that they are also suitable for aluminium boats, where the negative needs to be separated from the hull. Mastervolt alternators offer a much higher output than the alternators supplied with engines. As a result, the standard single belt is insufficient to transfer the power from the engine to the alternator. Two belts are required and the pulley of the engine will often need to be changed as well. Your engine supplier can help you choose an appropriate double pulley and give advice on setting up the alternator. In order to handle the high output you will also have to adjust the alternator support. The Alpha Pro charge regulator maximizes the output of Mastervolt Alpha alternators or any other alternator by regulating the alternator in a way that the batteries receive the optimum charge. The proven 3-step+ charge method used by all Mastervolt battery chargers guarantees fast and safe charging of your batteries. The charge regulator is designed as a ‘fit all’ solution, just one unit is needed for both 12 and 24 V applications, with a simple selector switch to set the regulator to the right voltage. 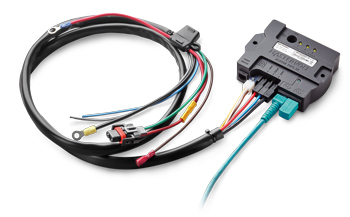 The unit can also be used on any other brand of alternator that has a standard Bosch connector; an optional connection cable is available (product code 45510500. Easy operation LEDs on the body of the regulator indicate the charge phase. The Alpha Pro is also fully connectable to the MasterBus CANBus system, allowing easy monitoring via a EasyView touchscreen. In a MasterBus system the voltage drop over the battery cable will be compensated automatically, as well as the battery temperature, improving the charging time without having to install additional cabling. The MasterBus communication also ensures a safe and efficient charge of the Lithium Ion batteries. The Alpha Pro helps to cut emissions by requiring less run time because it maximises the power from any alternator. A battery can be charged quickly even at very low RPM, especially when connected to an Alpha series alternator. By connecting the Alpha alternator to a Battery Mate or battery isolator, several battery banks can be charged simultaneously. Alpha Pro charge regulator, supplied with a Mastervolt alternator as standard.